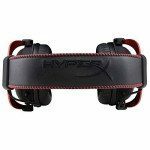 Kingston’s HyperX Cloud II gaming headset is easily the best you can get for under $100, and you can’t really beat its quality without spending a fair bit more. The sound quality is great and the mic is crystal clear – you really can’t get a better gaming headset for under $100. When you hear “Kingston HyperX” the first thing you might think of is RAM, if anything. Am I right? You definitely didn’t think of a great gaming headset, not unless you’ve owned one before. Along with great RAM, Kingston also makes some really great peripherals, like the HyperX Cloud IIs. Although, when you’re spending this much you could probably get a comparable headphone + modmic combo for around the same price. The HyperX Cloud II gaming headset is the result of an amazing decision by Kingston; to take an already good pair of headphones (the Takstar Pro80), slap a mic on them, change the colors, and give them a name more appealing to “gamers”. Amazing, right? The Kingston HyperX Cloud II is a great gaming headset which features awesome sound quality, a detachable mic, a bag full of accessories, and retails for under $150. 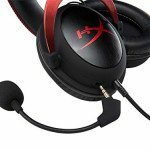 The Kingston HyperX Cloud II(2) gaming headset was an easy pick for the best gaming headset under $100, at this point in 2015 that is. Kingston did something that a lot of other brands should start doing; they took an already good pair of audiophile headphones, and slapped a mic on it. The design is nice and basic and maintains a sleek and modern look. The detachable boom mic allows this unit to work as both a gaming headset, and something you can use for music while still looking good. It offers a number of features you would expect out of a headset at a higher price-point, and it performs like one as well. The sound quality is amazing for what you’re spending, and it works great when it comes to outputting quieter sounds like footsteps or the rumble of an idling motor. The HyperX Cloud II also does well when used for music and movies, but it’s definitely not as bassy as you might like. 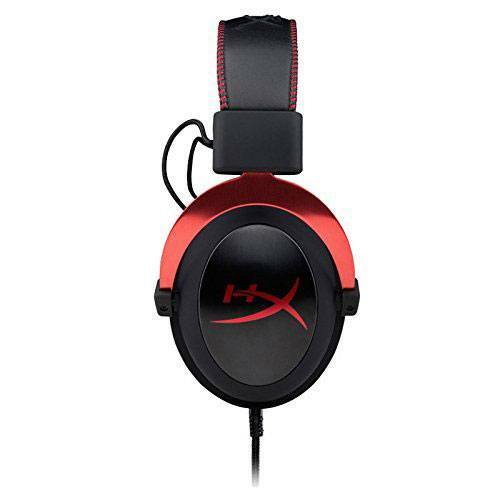 You also get a number of accessories and modifications when you purchase the HyperX Cloud II, most importantly the USB sound card which acts as a built-in remote and works the headset’s built-in “7.1 surround sound”. For starters, the HyperX Cloud II comes in 2 separate core-pieces, the actual headset unit, and a USB sound card module. The Cloud II is a wired headset, and features a braided cable which measures just over 3 feet long. The USB sound card module also features braided cable, but it is roughly 6 feet long. Most gaming headsets feature sharp lines, glowing lights, bright highlights and usually look like something out of a science fiction movie. But, Kingston decided to go another direction when they designed the HyperX Cloud II gaming headset. They look and feel more like a high-end pair of dedicated audiophile headphones, and that’s because they are, or were, at one point. They are actually Takstar Pro80 headphones, with a decent microphone slapped on. The Cloud II’s are made out of a combination of metal, plastic, memory foam, and a leather-like material which feels nice to the touch. The memory foam can be found in the headband and in both sets of earpads. The earpads are held on by metal hinges which allows them to rotate in and out, unfortunately they don’t swivel or fold away. The cable runs into the left earcup and cannot be removed like the mic can. By making the mic and USB sound card detachable, you’re able to pop them off and have a pair of nice looking of over-ear headphones that you can use for pretty much anything. They also come with a little rubber plug that you can use to hide the mic input. It comes in 3 different color-schemes, which is nice if you’re not a fan of the black/red ones I featured up-top. The other 2 color-schemes are black/gunmetal, and white/pink. The Cloud II’s overall sound-quality for both high end and low end frequencies is great. 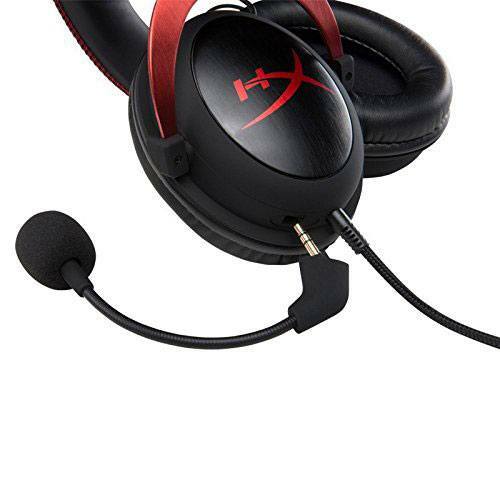 The headset does an awesome job of amplifying things like footsteps, gunfire and explosions. One gripe I have with this headset, and basically any other gaming headset, is they make the claim to produce “virtual 7.1 surround sound”. They just don’t tell you how virtual it actually is. 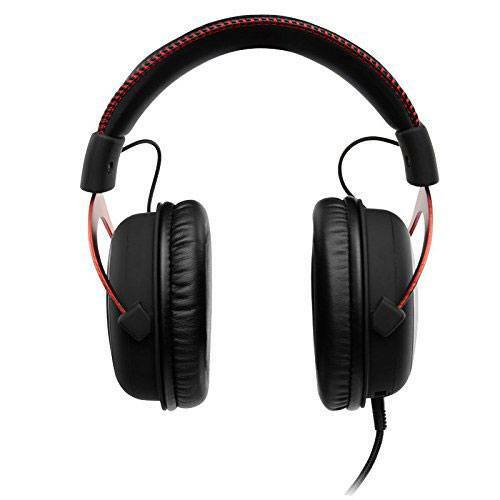 Any headset like this uses audio processing to mix the left and right channels in such a way to make the output sound similar to surround sound, but it’s not actually “surround sound”. Achieving this in a headset is still a couple of years away I think. Don’t get me wrong, this isn’t just an issue with this specific headset, it’s an issue with pretty much any headset you’ll get. It doesn’t mean the quality of the headset is lacking either, because the Cloud II outperforms everything in this price range. 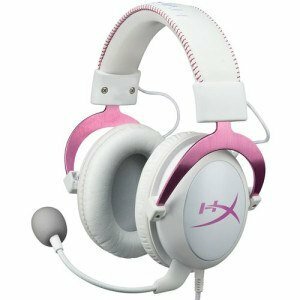 When using the headset for music or movies, you won’t be disappointed as the sound quality is crisp and clean with no noticeable loss, distortion or crackling like other headsets are plagued with. One of the primary accessories is the USB sound card module. Without it, you’re unable to work the volume or surround sound features of the headset. 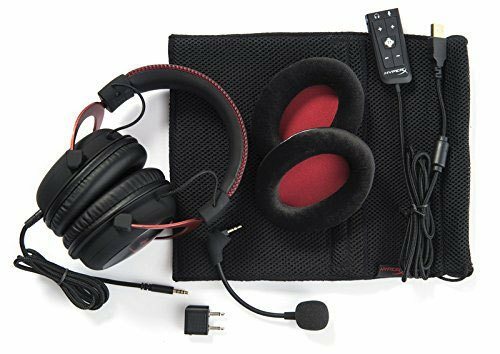 The headset will work without the sound card module when used on your phone or music player, but for gaming, you definitely need to be able to fine-tune your mic volume, etc. It also works as a Digital Analog Converter (DAC) and handles all audio output (instead of your on-board card); without the sound card module, the Cloud II is nothing more than a basic stereo headset. The Cloud II comes with a large nylon carry bag that has more than enough room to easily hold everything you get in this set. 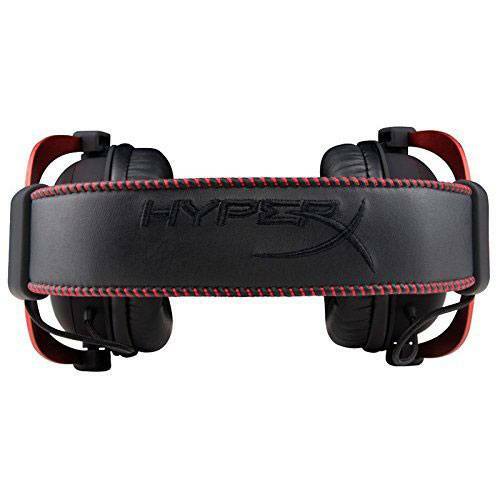 It’s also shipped with a replacement set of earpads which are made out of a more breathable mesh-like material, just in case you’re not a fan of the leather-like material they come equipped with. And of course, the bag has pre-fitted pockets to hold all of the accessories. Last but not least, the Cloud II also comes with a 2 plug airplane adapter, which is something that most companies don’t even consider, but if you’re flying often, you’ll be thankful you have it. 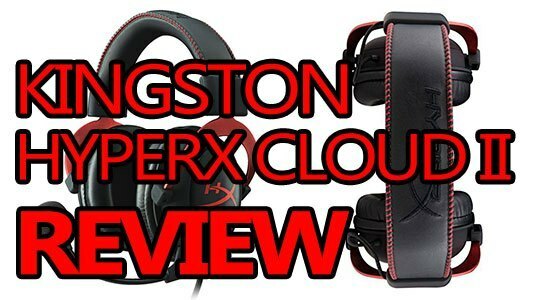 The Kingston HyperX Cloud II is an easy pick for the best gaming headset under $150, especially when you consider that it’s only under $100 depending on where you shop! It boasts a nice, sleek, modern design and a detachable mic which allows this headset to work double-time as an attractive over-ear headset. The sound-quality is amazing, and it does a great job of amplifying all those little sounds you need to hear to own your enemies. If you’re in the market for a new headset, and you’re on a budget of $150, the Kingston HyperX Cloud II is the best choice you could make. 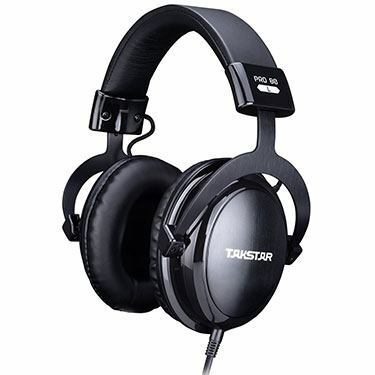 To make a fair comparison to any other headset out there, another company would have to repurpose a great set of audiophile headphones like the Takstar Pro80.